Councillors in Kent have voted in favour of building a coal-fired power station, the UK's first for 24 years. 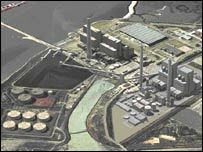 Medway Council gave its approval to a planning application by energy company E.ON UK to build two new cleaner coal units at Kingsnorth, near Rochester. But opponents say the move would be a serious setback to efforts to cut the UK's carbon emissions, with Greenpeace labelling it "dinosaur technology". The final decision on the plan will now be made by the government. The last coal-fired plant to open in the UK was built in Northern Ireland 24 years ago. E.ON says it would demolish an existing power station at the Kingsnorth site and replace it with one that is 20% cleaner. Paul Golby, chief executive, said the company had made a public commitment to reduce its carbon emissions by half by 2030. "This particular investment is significantly more efficient than conventional coal plants and that is equivalent to taking about half a million cars off the road," he told BBC Radio 4. He added that the new power station would hopefully become the UK's first clean carbon demonstration plant, with carbon captured from it and stored in depleted oil fields under the North Sea. But Ben Stuart, the communications director of Greenpeace, accused E.ON of being "the largest polluter in Britain and being reckless in building the power station". He said carbon capture and storage was not viable in the first half of the 21st Century and the new plant would emit 8.4 million tonnes of CO2 every year. "A new generation of coal-fired power stations in the UK beginning with Kingsnorth would quite simply end any hope we have that Britain can meet its long-term climate change targets," he explained. Friends of the Earth added that the council's decision to give its backing "to an outdated and dirty coal-fired power station" was disappointing. Energy campaigner Robin Webster said: "If built, Kingsnorth power station will undermine the government's commitment to meet European targets for producing 20% of energy from renewables by 2020. "If it is serious about tackling climate change the government must throw out this proposal and promote investment in clean and green alternatives." Medway Council does not have the power to grant or reject planning permission, but was asked to give its views to the government. It had received nearly 9,000 objections, more than 8,000 of them in the form of e-mails, postcards and letters in standard Greenpeace wording. But earlier officers had recommended that the council did not object. Bob Marshall-Andrews, Labour MP for Medway, said the application was of national and international importance because of its impact on the environment. E.ON UK says that, if approved, the power station would be up and running by 2012 and would provide enough energy for 1.5m homes.